Jordan would much rather be on deck than in a saddle. Illustration by David Hopkins. Rock star Ronnie Wood has created some of Jordan's favourite artworks. Image courtesy of Featureflash/Shutterstock. My arse is very sore! I’ve just spent the day on a horse, filming out in Austin, Texas, with Channel 4 for their coverage of the US Grand Prix. They had me, David Coulthard, Mark Webber and the presenter Steve Jones on horseback, rounding up cattle for most of the day – all for a three minute segment! It’s always like this. You spend hours messing about for a tiny edit of all the footage. Anyway, I can ride a horse, but let’s just say it’s not my natural state. I’d much rather be on teak than leather. 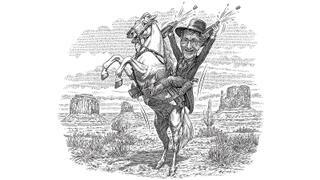 I was asked to think about art for the column this month, and spending a day on horseback has shaken loose a few memories. 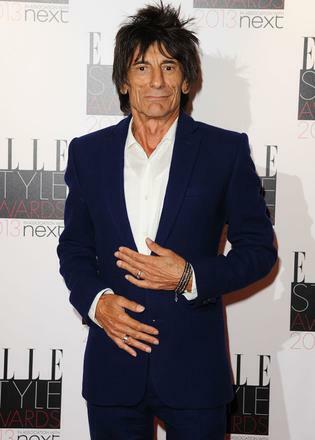 My favourite involves Ronnie Wood, who is actually the most incredible artist. He did, over a huge seven foot by six foot canvas. It’s an amazing painting, totally captivating. It was hanging in Blush for years, but came off when I sold the boat. Ronnie has since tried to buy it back for way more than I paid for it, but there’s no way I’m selling. Another piece I couldn’t part with was a big glass sculpture of Blush done by an Irish guy called Eoin Turner. I did him a favour once by introducing him to an aircraft manufacturer, and he more than paid me back by making this model. I didn’t know anything about it, and found it in my suite when Blush was delivered. It’s a brilliant replica, about four feet long. I also took off a few prints by David Yarrow. He, Charles Dunstone and I were directors of a company called Clareville Capital, but he gave it all up to become this amazing photographer. He was a great hedge fund guy, but when you see his photos, you understand. My favourite is one called Grumpy Monkey. I don’t believe you have to spend a fortune on art – so long as it’s directly personal. All those pieces mean something to me and have an emotion attached to them. I’ve actually appeared in a Ronnie Wood painting myself. It was commissioned by Andrew Lloyd Webber and it’s supposed to show London’s movers and shakers just after the millennium. I went up to Ronnie’s house in Richmond Park and there was Pattie Boyd to take my photo, which Ronnie then painted from. Pattie was, of course, married to George Harrison, who was the most chilled out guy I’ve ever known. He used to turn up to my house dressed in disguise. Occasionally he’d sneak into our garage when I had the F1 team. I once spent an amazing New Year’s Eve at George’s house, where I taught a hero of mine, Jim Keltner, who played drums in the Traveling Wilburys, how to play the spoons.